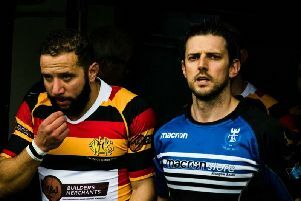 Dalziel Rugby Club head coach Benjy Barsanti has vowed that Saturday’s 81-0 home humbling by Newton Stewart will never happen again. Dalziel – whose team was ravaged by injuries to key men – endured a nightmare start to their BT National League Division 3 campaign but Kiwi Barsanti is remaining positive. “I had a discussion with the players after the game,” he said. “And there was a joint commitment to say that something like that won’t happen again. “It was our doing rather than them being a great rugby team. Our forward pack is out injured at the moment but you have to deal with the hand that you are given. “The boys worked pretty hard but they just weren’t quite there. “Getting 81 points flattered Newton Stewart. “It was only 12-0 just before half-time from two opportunist tries by them. “We feel that we had control in certain aspects of the game but the inexperience of our boys showed in the second half. Barsanti admitted that some Dalziel players’ heads had gone down during Saturday’s hammering, but stressed that a fair amount of his boys kept battling on regardless. “It’s impossible to discount the fact that some players’ heads may have gone down,” he said. “But it’s hard to keep going under those circumstances. “We made a lot of unforced errors and had a lot of missed tackles. “That got Newton Stewart’s heads up and they decided to run at us a lot more. “I don’t think that this defeat will be that damaging for us. “It is a good time of the year for that to happen. It demonstrates to our players that they have a lot of hard work to do. “In a 22-game season it is four points lost. Benjy said that changes to Dalziel’s starting 15 will definitely be made for this Saturday’s league fixture at Ardrossan Accies. “But these changes won’t just be based on the Newton Stewart result,” he said. “It would be unfair not to pick someone just on the basis of one game.